As one of serverless families in Azure, Cosms DB is becoming very popular. In many development scenarios, Cosmos DB actually replaces existing RDBMS because it requires relatively lower cost for maintenance, and is easy to use. Another serverless family, Azure Functions, also provides triggers and bindings for Cosmos DB. However, in Azure Functions V1 and V2, they are slightly different from each other from the Cosmos DB point of view. In this post, I am going to discuss how they are different from each other, and what version of Azure Functions we should choose with regards to Cosmos DB. At the time of this writing, the latest version of Azure Functions and Web Job Tools is 15.0.40108.0. With this tooling, when we create an Azure Functions project, we are asked to choose the version V1 or V2. So, technically, even though the tooling doesn’t provide the template, we are still able to generate Cosmos DB triggers by our hands. Let’s make this happen. Azure Functions V1 uses the NuGet package, Microsoft.Azure.WebJobs.Extensions.DocumentDB 1.1.0. This package has dependencies on Microsoft.NET.Sdk.Functions 1.0.8 which also has a dependency on Microsoft.Azure.WebJobs.Extensions 2.1.0. 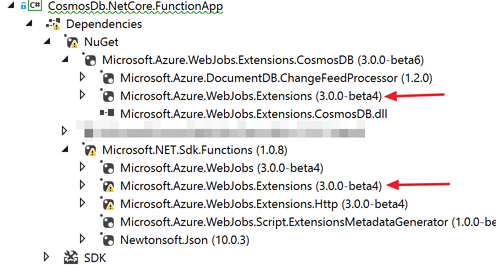 On the other hand, Azure Functions V2 uses the NuGet package, Microsoft.Azure.WebJobs.Extensions.CosmosDB 3.0.0-beta6. 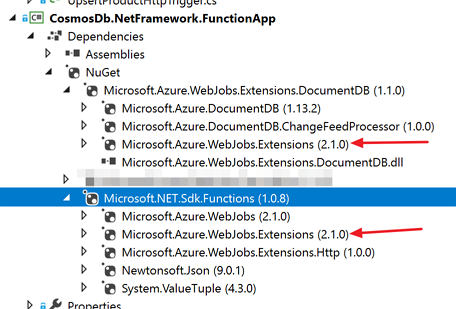 The Azure Functions SDK has a dependency on Microsoft.Azure.WebJobs.Extensions 3.0.0-beta4. Please be mindful that V1 and V2 are using a different NuGet package for Cosmos DB. I hope this will be consolidated sometime soon. View the code on &amp;lt;a href="https://gist.github.com/justinyoo/ab73b7afa3ab09a79daca2c68e2895ec"&amp;gt;Gist&amp;lt;/a&amp;gt;. It uses the attribute class, CosmosDBTrigger that comes from the NuGet package, Microsoft.Azure.WebJobs.Extensions.DocumentDB. On the other hand, although V2 uses the same CosmosDBTrigger attribute class, but it comes from the different NuGet package, Microsoft.Azure.WebJobs.Extensions.CosmosDB. Also, V1 uses a default connection string key of AzureWebJobsDocumentDBConnectionString, while V2 uses a default connection string key of AzureWebJobsCosmosDBConnectionString. The CosmosDBTrigger only accepts hard-coded database name and collection name so it’s very hard for configuration and testing. However, Azure WebJobs SDK has the INameResolver interface that interprets app settings key into its value. With this feature, we can easily pass configurable database and collection name through app settings. So, the trigger part is basically the same as each other in V1 and V2 except NuGet package and connection string key, which is good for developers not to get confused too much. View the code on &amp;lt;a href="https://gist.github.com/justinyoo/8540f08c5d9d8fdc4e6cfc17802bc40a"&amp;gt;Gist&amp;lt;/a&amp;gt;. View the code on &amp;lt;a href="https://gist.github.com/justinyoo/2e8f58b30774b3a381995c7b1ab07b89"&amp;gt;Gist&amp;lt;/a&amp;gt;. It instead uses the CosmosDB attribute class. Which Version to Choose – V1 or V2? Why are they different from each other? As we can see their version of NuGet packages, V1 is running on Azure WebJobs 2.x while V2 is running on Azure WebJobs 3.x. Eventually, when V2 becomes GA, all 2.x related classes (the DocumentDB attribute class for example in this post) will be deprecated and no longer supported. If you are currently running Azure WebJobs and Functions V1, and still have time for migration, stay V1 but prepare migration to reduce hiccups on those changes. If you start implementing Azure Functions, I would recommend using V2 because it is running on .NET Core, which supports cross-platform development environment. Of course, currently number of supporting templates in V2 is way too smaller than V1, but it is just matter of time. Actually, these reasons are not as enough as for choosing V2 in your Azure Functions development. But think of this. In V2, the out-of-the-box dependency injection feature is on the way. That is soon to be baked into V2. Hoping with the next drop. This feature will be a huge step forward for V2 in Azure Functions. Even only with this feature, I would suggest and use V2 to make your function codes easily mockable, testable and decoupled. As soon as this feature is shipped, I will review it and post another blog for dependency injections. So far, we have briefly discussed a few differences between Azure Functions V1 and V2, and choosing the most appropriate version between both. I hope this post will help you develop Azure Functions application with Cosmos DB.